Just spotted this today – and it’s not going to be available for a while, July maybe, and there’s not even anything to listen to yet, and it’s just a Eurorack module – BUT it looks absolutely amazing! The Basics: You feed it an audio stream, anything from something simple to a complex mix. 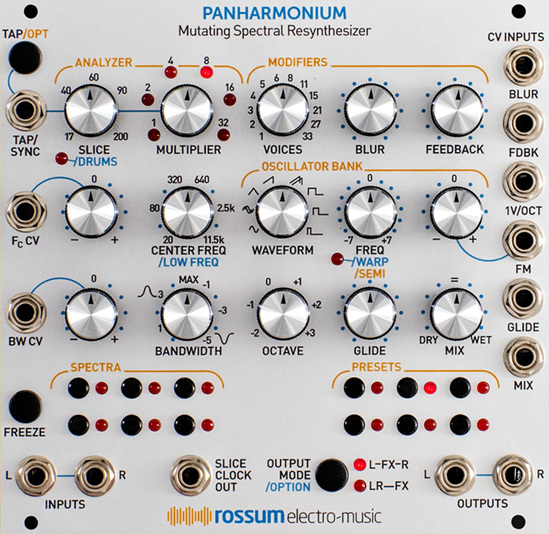 It spectrally analyzes this and the lets you additively resynthesize and recreate the harmonic structure of the sound while you modify the basic elements of that structure. This technique has been around for a while, but the implementation Rossum has put together here looks very promising. The module allows you store presets as well as store ‘freezes’ that can be modified and used like an oscillator source. There is an article here at Synthtopia that discusses it. Isnt that what the Kyma system does? A mate of mine had one. Synthesising audio waves addively from sine waves. Awesome stuff. I dont have a eurorack system but this looks enticing! Harmor in a module ? Check out Gunver Ryberg, she uses one. Both in studio and in her live sets. Bold! This looks super cool. Haven’t bought a module in a while, but may have to get this. Another demo from Rossum. This blows my mind. Sounds crazy nice. Anybody know any plugin coming close to this?